We are all about sound effects in this house right now- ta da, boom and various animal noises (woof, roarrrrrr, hissssssssss and baaaaahhhh are mastered but still working on moo, meow and quack). These sounds are very comical to the two of us. She loves to knock over blocks (BOOM!) or when she sees a dog in the neighborhood (woof woof woof!) and of course, we laugh and this just encourages the sound effects. Not exactly expanding the vocabulary but very fun. Mom came up to visit and we went out for shopping and pizza. Miss H loved the roasted garlic and chicken pizza but Kerry complained about her garlic breath for the rest of the day 🙂 We thought we had exhausted her from the outing but I got a good glance inside her mouth and discovered two more teeth coming in. Poor kid has been teething all summer! Lucky for us- she does not get too upset about it but we can tell she does not feel well. 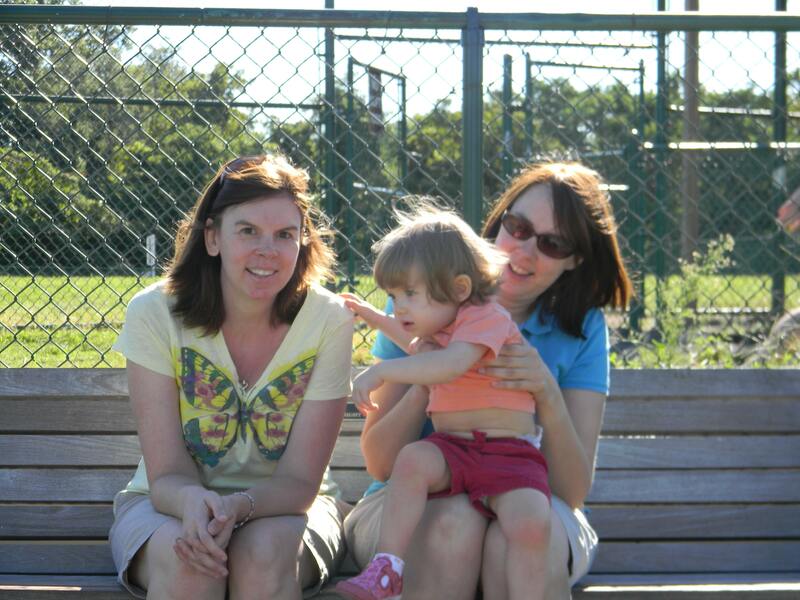 Leigh came to visit on Sunday and we made our usual trip to the farmer’s market and playground. We tried to get a picture but someone was not cooperating. 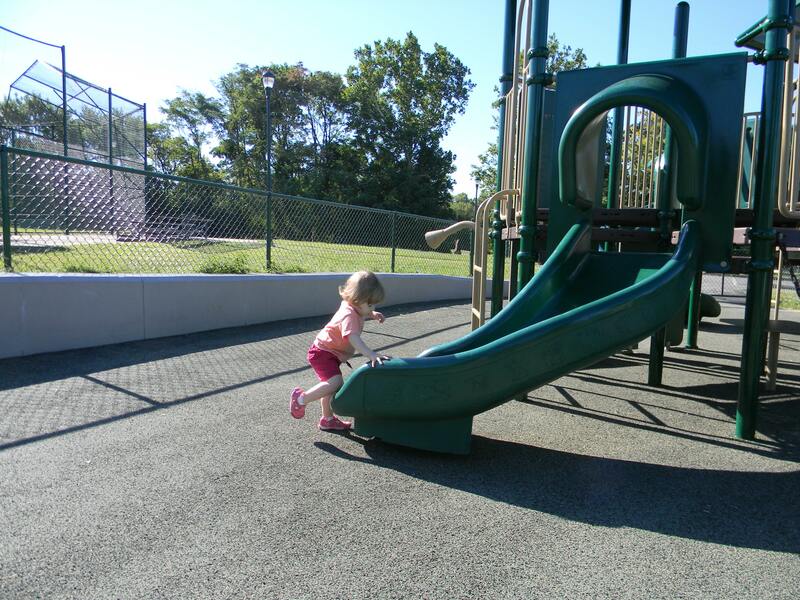 All she wanted to do was run around the playground and climb up the slide. Miss H wore Leigh out- after her visit with us she had to go take a nap. After Miss H got a nap- we headed to a friend’s house for a Labor Day cookout and had a great time. We stayed a lot longer than expected because Miss H became best buds with the hosts three year old and they completely entertained each other. He shared his Buzz Lightyear with her and she shared her hotdog bun with him. We joked about this leading to a future prom date. I made coconut cupcakes for the party and it is always a compliment when the hostess hides a few in the fridge and the plate did not even get completely passed around before they were all gone. That recipe becomes a favorite! ← Yeah for three day weekends! 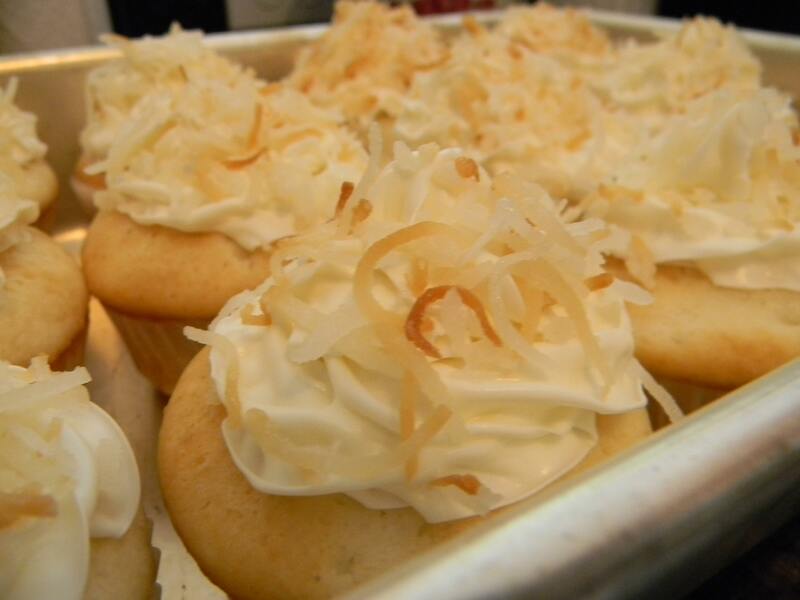 Those coconut cupcakes look AMAZING!!! Glad you had a good weekend!